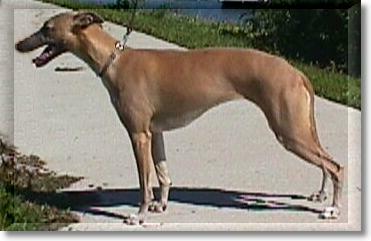 Spirit came to the United States in April 1999. She has a loving personalitiy and bonded with Gloria during her visit to South Africa. 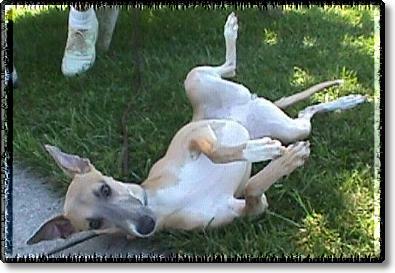 Neither racing nor coursing are legal activities in South Africa but Spirit loves to chase moving things. While in South Africa, she demonstrated her prey instinct and agility by running across a horse paddock and scooping up a bantam rooster without so much as a stop after she had his wing in her mouth. Roosters - Bunnies - they're all the same to her! She's a Whippet who is happiest with 24-hour a day human contact. At night, her favorite spot is under the covers with the people she owns. Spirit plays with the other dogs and is very good with puppies and we love having her with us. 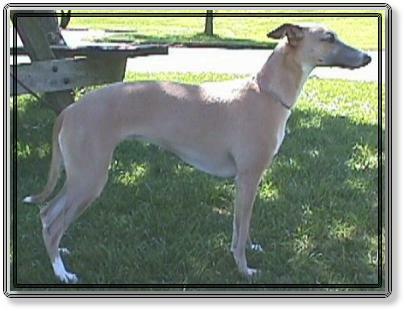 Special thanks to her former owner, Jo Robertson (Merlanjo), for allowing Spirit to come to the United States.